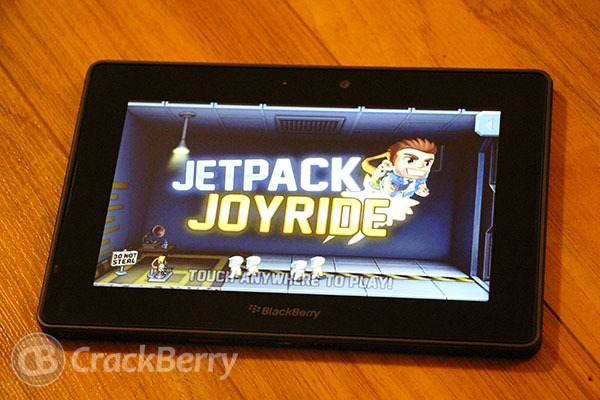 Jetpack Joyride for the BlackBerry PlayBook now available for free! You'll start off with the legendary Machine Gun Jetpack to scatter the evil scientists of Legitimate Research, but throughout each game you'll collect coins and complete missions to earn cash and buy new gear in The Stash! Pick your favorite jetpack, snazzy outfit and stock up on items then get back out there! Stay alive, get funky and lose yourself in Jetpack Joyride. There's so much to see and do, all the time in the world and more than enough jetpacks! As always, Barry Steakfries will provide! In short, it's a pretty awesome game that everyone should add to their collection. More importantly, it's the first Halfbrick Studios game to launch onto BlackBerry World and there is going to be more where that came from. Check out the game trailer below to catch it in action then hit the link to get it downloaded for yourself. Thanks, BB-Bmore!